Now I See A Person Institute (NISAPI) is a non-profit organization that specializes in Community Engagement: A Collaborative Recovery Model (CEACRM) of mental health and substance abuse treatment. We provide therapy (trauma related, histories of unresolved symptoms, severe family conflicts), family reunification and parental alienation services (monitoring, therapeutic visitation, supervised visitation), and family and individual life coaching services in a naturalistic environment in Los Angeles County, California. In addition to these services, we offer training and multiple learning venues for clinicians in the collaborative recovery model of community-based services, (CEACRM) and collaborative practices. This includes an international hosting program for learners to immerse themselves for lengthy periods of time and our ICCP programs. We are associated with international colleagues who share similar passions to provide services for trauma and parity and co-occurring diagnoses, where hope for change has disappeared. NISAPI specializes in high-risk populations of trauma and resultant symptoms and family conflicts. 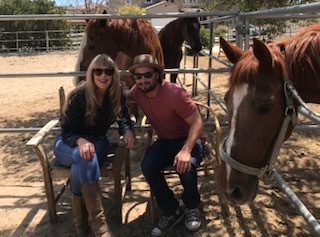 Our clients, with histories of extensive trauma, histories of unsuccessful therapy or psychiatric intervention, come to a nurturing and normal horse ranch to heal and recover (Swim, Stephan, Abramovitch & Stone 2014). Our model of therapy is evidence based reflecting recovery for a broad range of mental health challenges, populations and diagnoses. Now I See a Person Institute–Healing Under-served Populations from Trauma– using CEACRM at a horse ranch. Our clients, with histories of significant trauma and unsuccessful treatment histories (“under-served populations”), come to a nurturing and normal horse ranch to heal and recover. Within our theoretical model we involve significant members within the client system to aid in transformation for long lasting and sustainable change (family members, and if necessary lawyers, social workers and other community members involved with the clients). Our clients learn to see themselves through genuine and strength-based lenses that transcend diagnosis, conflicts or treatment history into new self-identities, full of agency-empowerment, and leaving behind hopelessness and despair. Our clients help to direct their own change and new possibilities in the lives they wish to lead. We believe in and listen to every client and their family’s needs to create the goals they wish to accomplish. We invite and aid in creating new understandings of the person and new definitions they wish to represent themselves…new beginnings that transform the past. Through supportive and positive dialogue and conversations for new experiences and possibilities, goals arise and are met in a safe and spontaneous manner. As opposed to an office setting, the outdoor environment of a horse ranch provides an atmosphere of embracement, normalcy and encouragement. The resulting conversations between therapists and clients surrounding themes of overcoming trauma, building healthy relationships, building attachments, managing conflicts and symptoms, and promoting healthy self-identities occur seamlessly. Clients learn to be co-facilitators in a journey of change and feel they are listened to and are making the changes they desire to, in their lives and in those of their families. This happens despite treatment histories or current severe conflicts, trauma and symptoms (Swim, Abramovitch, Magardechian, & Stone 2016). We wish to create an environment in therapy where one does not feel judged, but is allowed a safe conversational space where the client can lead us to what is important to talk about, and in their own time and pace. Here the client can learn to be the PERSON they desire. Our belief is that clients need the freedom to express their thoughts in a manner that respects and hears their ideas for change. Once our client’s co-create their goals, change happens almost spontaneously. The horses who welcome our clients provide love and nurturance, as well as our team of caring therapists who help promote change where change was impossible in the past (Swim, Stephan, Abramovitch & Stone 2014). All services happen at a horse ranch within venues that promote natural, normal and nurturing environments. 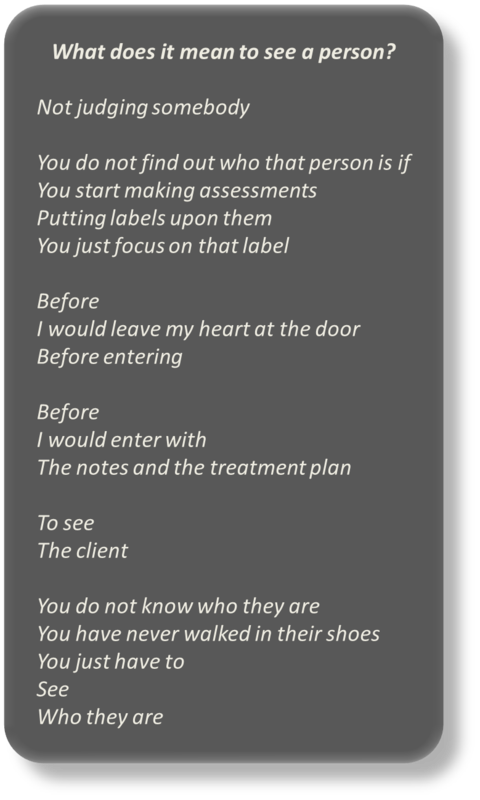 In our research clients’ report “feeling like they weren’t having therapy” was paramount in their journey to change. Follow us on LinkedIn: Dr. Susan Swim, Twitter:@nowiseeaperson, Instagram: nowiseeaperson, utube:http://youtu.be/M1_GzLspStU, or NowISeeAPerson UTUBE for our latest short interviews.